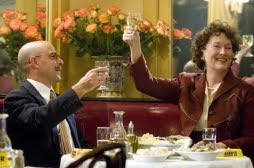 I just saw Julie & Julia (with blogging goddess Reading Rants) and, as you might suspect, I loved it. The food looked gorgeous, Meryl was superb, and my crush on Stanley Tucci was confirmed. I agree with most reviews in that I would have loved to have seen more of Julia Child, particularly her relationship with Paul, her father, and France...in fact, I would have been the most pleased if the movie had been a straight biopic, based on My Life in France. But that's me. As I suspected, the movie brought out the introspection in me because to talk about Julia Child is not to only talk about food. Because food is not just food. How you approach your cooking and your kitchen and your table is a euphemism for how you approach your life. I believe that, truly. So to watch Meryl's incredible performance, as Julia, made me think about how I approach my life. And to juxtapose it with Julie Powell, or at least Amy Adams' depiction of her. I saw so much of myself in Julie Powell's character...and I wasn't happy about it. The self-absorption, the neuroses, the hysteria. And - shhhhh! - don't start protesting in the comment section. Seriously, unless you're the Husband, I honestly don't know if you can speak to this. And I'm not being self-critical...I'm self-analyzing. ANYWAY, it just made me think about how I approach the kitchen and food...and, thus, life. Then consider Julia Child's character: gusto, verve, passion. Was she stubborn as all hell? Well, of course she was. But I love the "never apologize, no excuses" approach. Her relationship with Paul is the type of relationship I emulate in my everyday life. I love the idea that when you're in your kitchen no one can see you - no one can see that you're not perfect. And that's okay. The kitchen is where you can shrug it off, patch things up, and move on. Make a mistake? Well, start again tomorrow. Being in the kitchen is all about second chances. Truly, Julia Child had that joie de vivre that I long for...and probably manage to achieve more than the next person. But that still doesn't keep me from constantly trying to attain it. Ultimately, watching Julie & Julia was a good wake-up call for me. I don't know if this happens to any of you, but I can tell when I'm in a funk by my relationship with food. I eat more than I normally would because I'm unsatisfied not by what I'm eating but by something happening in my life. I drink more wine than I might normally not because I'm celebrating but out of habit and...something else. I eat crappy things I might normally eat and get no joy out of them at all. And I'm clearly in a funk right now. Eat, drink, and bon appètit! We all have our own neuroses, self-absorption, and hysteria. It's part of being individuals.